The CIC School in Upper Allen Town, Sierra Leone was constructed in a resettlement area to provide primary education to children orphaned and or displaced during the civil war. 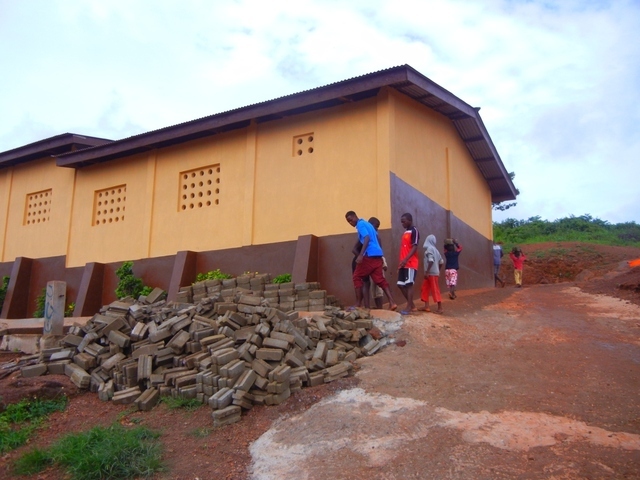 A new school building was funded by Schools For Salone in 2011. The primary focus of Bank On Rain is to promote the use of RWH as a source of safe drinking water. These systems can be more affordable than wells or other alternatives and so may be well suited for use in the developing world. Initially we had utilized roto-molded plastic water tanks manufactured in Freetown for rainwater storage, but had recently learned that Interlocking Stabilized Soil Blocks (ISSB) were being used for tank construction in Kenya and Uganda with considerable success. 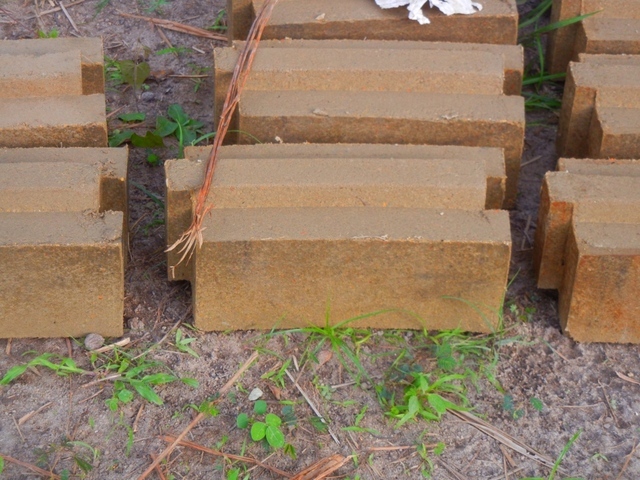 ISSB's are manufactured from soils found on-site and formed by a hand press utilizing local labor. After a 14 day curing process the ISSB's are stronger than fired brick without the use of fuel or kiln. We had proposed RWH systems at 2 schools in Sierra Leone for installation in 2013 and thought this would be a great opportunity to utilize ISSB water tanks for both. 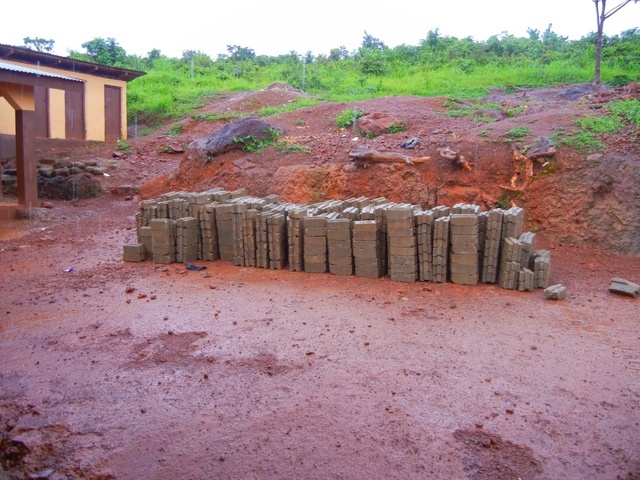 Our research indicated that there were no ISSB curved block presses in Sierra Leone, nor had there been any individuals from Sierra Leone that had been trained in the manufacture of the blocks or their use in construction. Bank On Rain purchased a curved block ISSB press from Makiga Engineering in Nairobi, Kenya and arranged to have is shipped to Sierra Leone. Working with Eric Silverman, a Peaces Corp Volunteer and teacher at the Barina Agricultural Secondary School in Makali, Sierra Leone we provided the press and training documentation to set up a ISSB manufacturing training program for students and staff at the Barina School. The extensive training included production of blocks and construction of a 10,000 liter water tank as part of a RWH system for a Teacher's Quarters at the School leading to issuance of certificates for those participating. 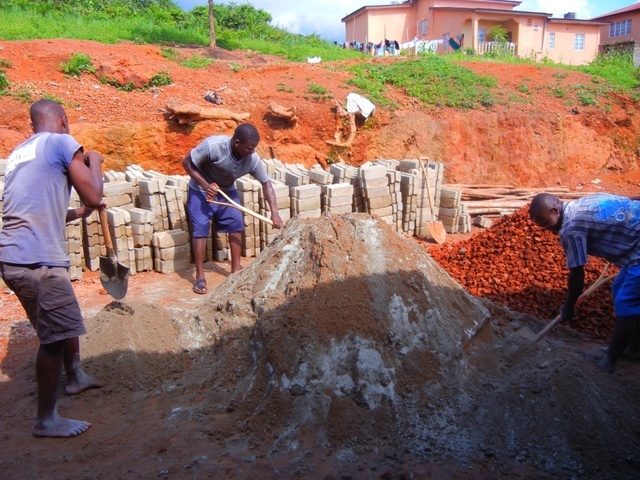 After completion of the training and successful completion of the Barina tank, Bank On Rain hired the Barina crew to manufacture enough blocks to build 2 more 10,000 liter tanks at the Children in Crisis Primary School in Upper Allen Town, transport the ISSB's to the site and build the tanks. Two experienced masons were hired to further train the students and oversee the tank building. Both the Barina and CIC school projects were great successes. Not only were the tanks of high quality, the participants used their new skills to earn wages comparable with experienced construction workers. Students, former students and senior masons are now familiar with ISSB's and we hope they will continue to promote RWH and ISSB construction, both being means to make safe drinking water more affordable at the village level. After the meeting with Schools For Salone in December, BOR volunteers had not been able to locate a press in SL for manufacturing the ISSB to construct the tanks. Contact with Makiga Engineering in Kenya (manufacturer of the ISSB press) confirmed that none of their machines had been sold to Sierra Leone, nor had any individulals from Sierra Leone attended the ISSB training program. 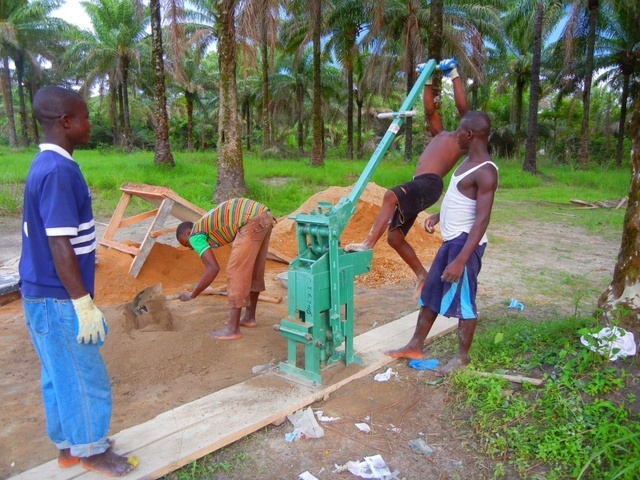 It was decided that BOR needed to build confidence in block manufacturing and tank construct if no experienced persons could be found in Sierra Leone and a ISSB machine was purchased which produces curved block to build 3 meter diameter water tanks. The machine was delivered today to BOR in Seattle, WA, USA. We intend to gain experience sufficient to train others and then ship the machine on to Sierra Leone for the CIC School water project. On Dec 5, 2012 Bank On Rain team members Mike Williamson, Gail Williamson and Ken Blair met with Cindy Nofziger of Schools For Salone, the non-profit that constructed the Children In Crisis School in Upper Allen Town, Sierra Leone. Michael Zylstra, a PCV recently returned from Sierra Leone and potential BOR volunteer also participated. Cindy provided detailed site information and description of future improvements that are planned for the school. Based upon this information the BOR team decided that storage tanks in the school courtyard would not be visible from the road or nearby homes and therefore could be targets for vandalism. The plastic tanks in our original system plan could be stolen or damaged. In the next years a domitory is to be built near the school and security should be improved, but for now water tanks construced from Interlocking Stabilized Soil Blocks (ISSB) would be a better choice. BOR would ask our contacts if ISSB curved block presses were available in SL to make the tanks. On December 5, 2012 a project planning meeting was held between Schools For Salone (the non-profit that funded the building of the School) and Bank On Rain. Present from SFS were Cindy Nofziger, the founder and co-Director and Michael Zylstra a mechanical engineer and PCV recently returned from Sierra Leone. Bank On Rain was represented by Mike and Gail Williamson and Ken Blair, all Directors of BOR. The proposed RWH installation and tank location was discussed and system security was mentioned as an area of concern. The school is located in a settlement area occupied by persons displaced during the war. As a new community, Upper Allen Town lacks the infrastructure of established villages and responsibilities to Elders and Chiefs with some authority over individual conduct. The school is situated on a hillside isolated from other houses, therefore there are no nearby responsible adults that might deter vandals from damaging the system. The tank locations chosen by BOR based upon the site plan was suggested to be particularly problematic, as they would be in full view from the access road but otherwise not visable by local residents. The school is in negotiation to purchase property adjoining the school where a residence would be built for the head teachers and 15 orphans who attend the school. When the residence is in place, security will be much better. We then discussed a RWH system for the new structure that could be integrated with the one planned for the school. With this in mind the tank location was changed and consideration given to Interlocking Stabilised Soil Block (ISSB) construction for water storage, as these would be less suseptable to damage than the proposed plastic tanks. BOR will reconsider the RWH system plan in light of the new information on security issues and will also evaluate ISSB tank construction at this site. Rainwater Harvesting is by its nature a sustainable means to obtain a safe, reliable and affordable source of drinking water. The CIC system is gravity fed, no pumps required to deliver water as in a well. In the village of Makali where Bank On Rain installed another school system there were 6 inoperative wells, most out of commission due to missing pump parts or a worn washer in the lower unit. Maintenance of a RWH system consists of keeping the debris filters clean, monitoring the water levels in the tanks and keeping the gutters in good repair. No special equipment or parts are required and potential problems can be identified by a quick visual inspection of the system. One of the unexpected challenges we have experienced in introducing RWH systems to schools has been doubt on the part of teachers and principals that clean, safe drinking water can be collected from metal roofing with obvious rust. With over 3 meters of rainfall, the school roof is very well washed and the captured water shows no discoloration nor metallic taste, but this has to be demonstrated to overcome long-standing opinions. Years of being told by NGO's and government health officers that surface water is not clean and that well water was the safest source may have contributed to misconceptions about rainwater harvesting. If the water is collected directly from a roof of proper materials (metal, tile) and stored in a clean, covered and screened container, there is little chance that human pathogens are present. Bird droppings, leaves and other organic material that may fall on a roof surface are generally of small amount and are exposed to massive UV disinfection (the principle behind the solar disinfection of water placed in the sun in clear plastic bottles). In regions of high rainfall like Sierra Leone there is little opportunity for surface water to be filtered as it rapidly sinks to the water table through porous soils. The 2012 cholera outbreak in Sierra Leone was due to ingestion of contaminated water drawn from wells. The CIC School is located on a well traveled track ("upper pipeline"), so many people pass by the school. The water tanks are located on the opposite side of the school from the track and are not visible from any of the surrounding houses. This somewhat hidden location may make the tanks susceptible to vandalism or persons not associated with the school obtaining water. The tank volume was calculated to provide drinking water for the students and teachers, but cannot sustain use by the community. After school hours the buildings are not occupied and we supplied locking water taps to discourage unauthorized use, but we do not know how effective this may be. During the rainy season the tanks could likely provide water to many more users, but making the water last through the dry months for 400 users leaves not leeway for any waste or stealing of water. We have asked that the school staff monitor the water levels closely so that any unusual drop can be investigated. 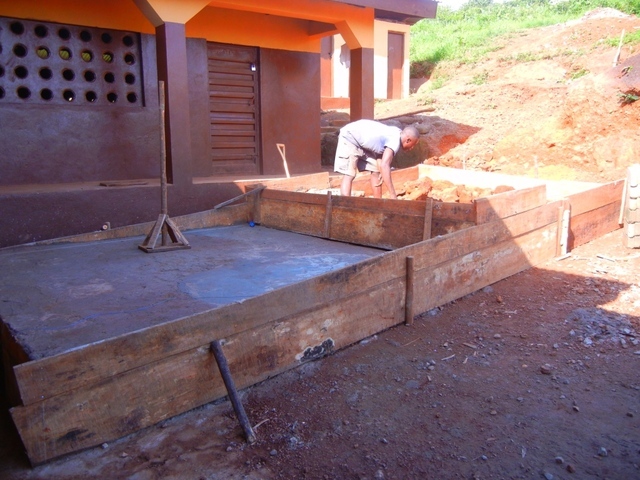 Due to the scheduled expiration of Eric's Peace Corps contract (mid August), Bank On Rain decided to build the ISSB tanks and install the RWH system at the CIC School in July, the height of the rainy season. The Upper Pipeline "road" leading up the ridge to the school becomes a track negotiable only by foot or motorcycle during the rainy season. The main road at the base of the ridge is about 3 km from the school and this required some creative transport to deliver construction materials to the site. Had we done this project in September or October logistics would have been much easier. Working in the rain required freshly plastered tanks to be covered with tarps to prevent the cement from washing away before it could dry. The concrete lids constructed to cover the tanks required several weeks to cure thoroughly, but on the positive side, we didn't have to haul water to the site to mix cement and mortar. The CIC Primary School is situated near the top of a ridge with no ready source of drinking water. The students and teachers bring drinking water and water for cooking meals from home each day. Since this locale has more than 3 meters annual precipitation, this school is a good candidate for rainwater harvesting (RWH) as a source for safe water. It was decided to construct water storage tanks using Interlocking Stabilized Soil Blocks (ISSB), a low cost material made with a hand press designed specifically for on-site manufacture. One concern about the school site was that stored water might be diverted by persons other than students and staff, and sizing of the tanks was based upon supplying water through the dry season for just the 400 students and staff. The project was formulated to provide a year-round source of safe drinking water for only the 400 students and staff. Our partner in Sierra Leone, Safer Future Youth Development Program (SFYDP) has developed a program termed Community Led Total Sanitation (CLTS) which we consider a neccessary precursor to providing safe drinking water in underserved schools and communities. Without education in basic sanitation and health, the benefits of a safe drinking water supply may be a largely wasted effort. 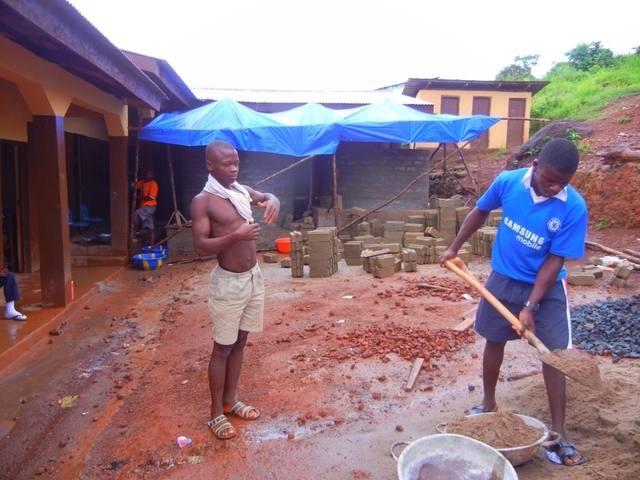 Safer Future have successfully implemented the CLTS program in villages and schools throughout Sierra Leone. We have used their trained facilitators and community organizers to provide the sanitation and health education as a vital component of the RWH systems we design for schools. For this project the CLTS program will be presented to the 20 staff and 400 students at the CIC School. Safer Future has provided this program at the Barina Agricultural Secondary School in Makali in conjunction with the RWH system installed in 2011. Learning the the relationship of hand washing and health is manditory if the full benefits of safe drinking water are to be gained through RWH systems. In selecting schools as the sites to construct these systems it is the intent of Bank On Rain that they serve as demonstrations that rainwater can be an affordable, dependable and safe source of water in Sierra Leone. It is hoped that the success of the school systems will encourage others to construct RWH systems for homes and businesses as an inexpensive alternative to wells. The recent cholera outbreak in Sierra Leone is thought to have been from contaminated well water, often assumed to be safe, but in areas of high precipitation the soils may not sufficiently filter surface water as it percolates to the water table. RWH systems may be a better choice in terms of both cost and safety.